A happy Sunday and International Woman’s Day! I’d like to end this week with an easy pie recipe: green tea meringue! It looks like I’ve jumped on the green tea bandwagon because a few post back I’ve placed a post about making your own green tea latte here! 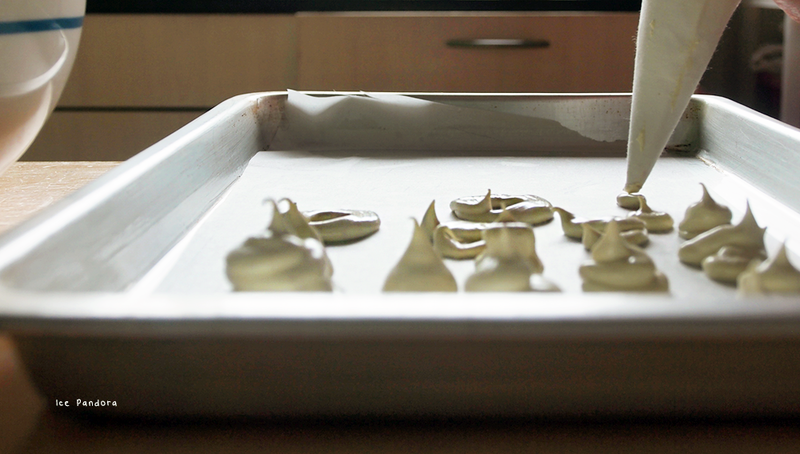 Making meringues doesn't require rocket science skills and you don’t need a whole list of ingredients too: just egg whites and plenty (with caution) sugar! And when you want to add flavour you just add flavour at the very end like I did with this green tea variation and then let the oven do rest and you’re done! 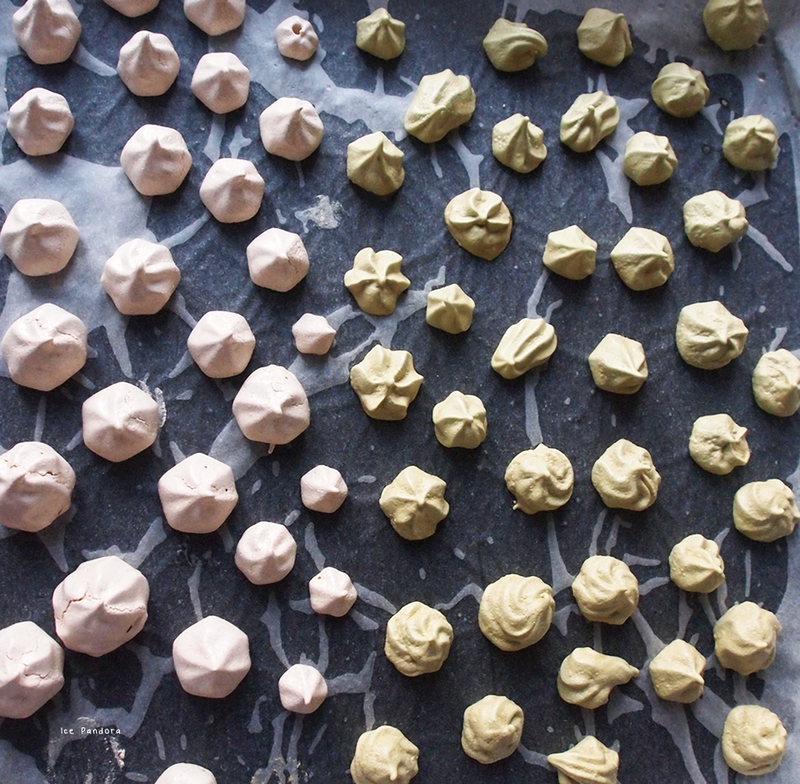 I’ve actually divided the meringue batter in two to create two different flavours: the green tea and cinnamon flavours. And I’ve learned something from it! I’ve actually whipped the green tea flavoured batch a tad bit longer than the batch for the cinnamon. After baking them both at the same time and temperature, the green tea one turned out a bit grainy whilst the cinnamon one is a lot smoother (scroll down to see proof)! 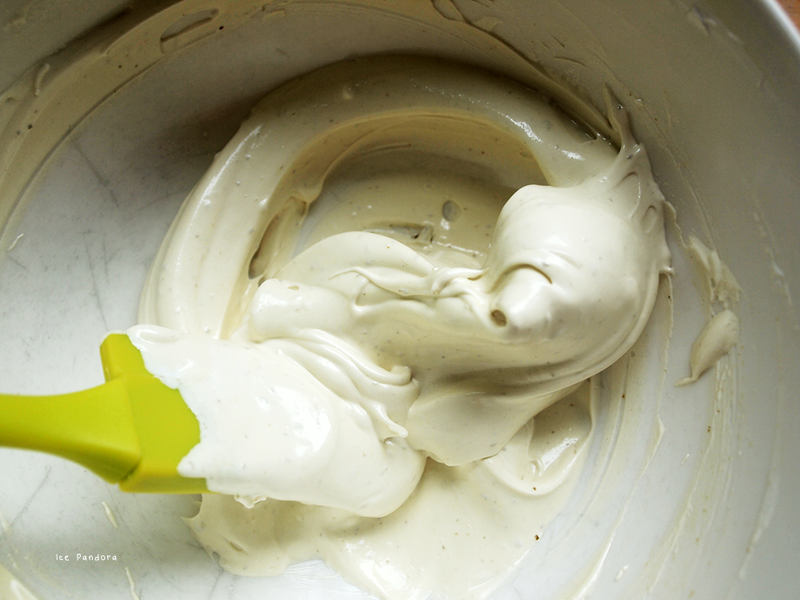 To make the story short: don’t overwhip your meringue batter. But no worries about the taste because they were both very delicious and crisp! I hope you’ll try out this recipe and wish you guys a wonderful week next week! 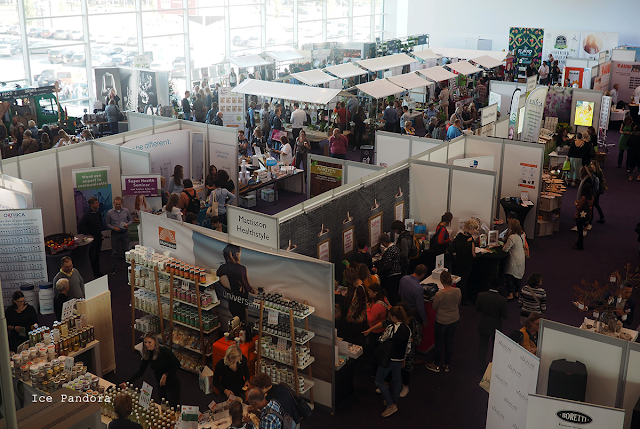 Een gelukkige zondag en International Vrouwendag! 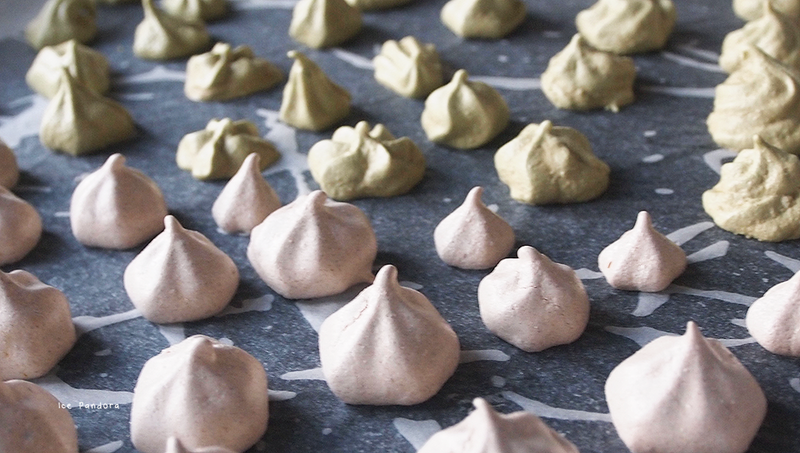 Ik wil graag deze week af sluiten met een ‘kind-kan-de-was-doen’ recept: groene thee meringue! Ik lijk wel helemaal in de ban geraken met groene thee want ik heb in aantal weken terug een post geplaatst over het maken van een heerlijke groene thee latte hier! Het maken van meringue is een eitje en je hoeft geen hele lijst aan ingrediënten bij elkaar te verzamelen: gewoon eiwit en veel (met mate) suiker! En als je een smaakje wilt toevoegen doe je dat gewoon op het einde, zoals ik dat deed met deze groene thee variatie en voor de rest laat je de oven zijn werk doen ben je zo goed als klaar! Ik heb eigenlijk de meringue beslag in tweeën verdeeld zodat ik twee verschillende smaken kon creëren: deze groene thee dus en ook in kaneel smaak. En ik werd hierdoor wijzer! En hoe. Ik heb namelijk de groene thee smaak wat langer met de mixer gemixt dan de kaneel. Daarna heb ik heb deze beiden smaken op dezelfde tijd en temperatuur in de oven gebakken en wat bleek: de groene thee meringue zag er wat korrelig uit terwijl de kaneel veel smoother uitzag (scroll naar beneden toe voor bewijs)! Om het verhaal kort te maken: niet te lang je meringue beslag kloppen. Maar ze smaakten voor de rest heel goed en knapperig hoor! Ik hoop dat je dit recept uitprobeert en ik wens jullie een fijn werk/school week toe volgende week! I've over whipped the green tea one a bit and as you can see: grainy surface. Luckily I was a bit lazy with the cinnamon one and look how smooth it looks. Lesson learned, no over whipping meringues. Pre-heat oven: 100°C and line and grease a baking tin with parchment paper. Beat up egg white + lemon juice in a clean and grease free bowl until soft peak has reached, then add gradually the icing sugar to high peak stage: thick, glossy, fluffy meringue. Add the matcha green tea powder until the meringue mixture and gently fold it through with a spatula until everything is combined well. 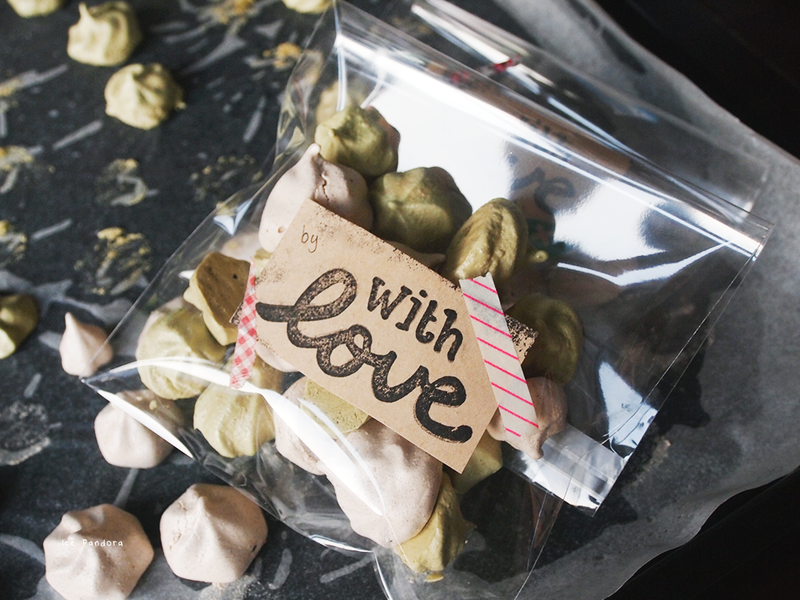 Scoop the green tea meringue mixture in a piping bag and start piping figures. If you don't have a piping bag you can always use a spoon and spoon the mixture on the baking tin. Once everything is piped out it's ready to bake in the pre-heated oven. Bake for about 40-45 minutes in the oven. Keep an eye on to avoid browning on the top of the meringues! Haha, I guess this is where being lazy can do you good! I heard it's bad to overmix things like cake, cookie, muffin, etc batter because it makes it tough and rubbery. It must be awesome to live in your household! 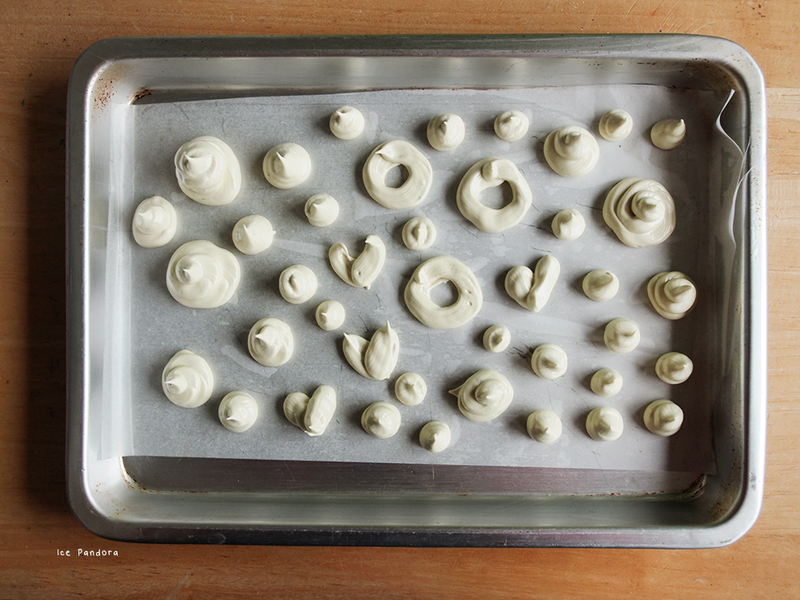 I never knew it was so simple to make meringues, for some reason I thought it was a lot harder. 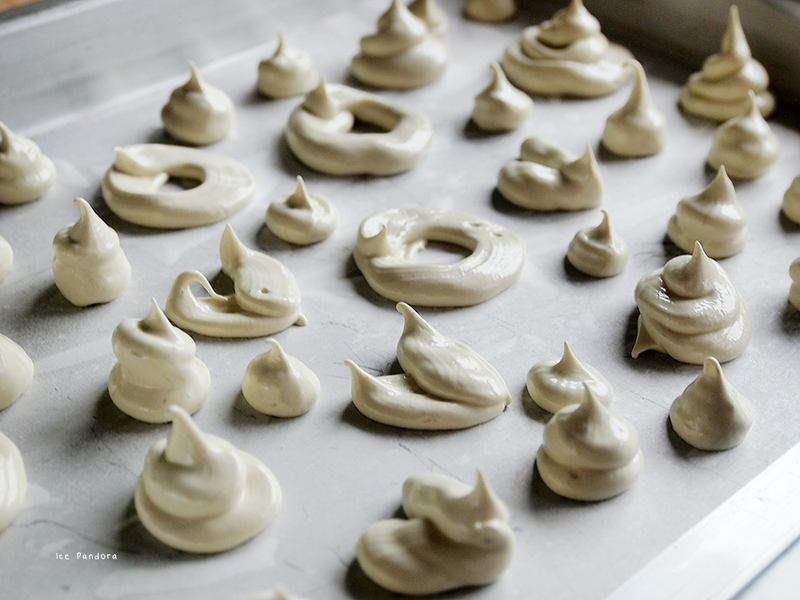 I've yet to try making meringues! Green tea is a pretty good idea for the flavouring. I love anything with green tea...but green tea meringue?? Sounds amazing!!!! sweet and tasty and looks like lots of fun to make too! I have to try this one day they look amazing! 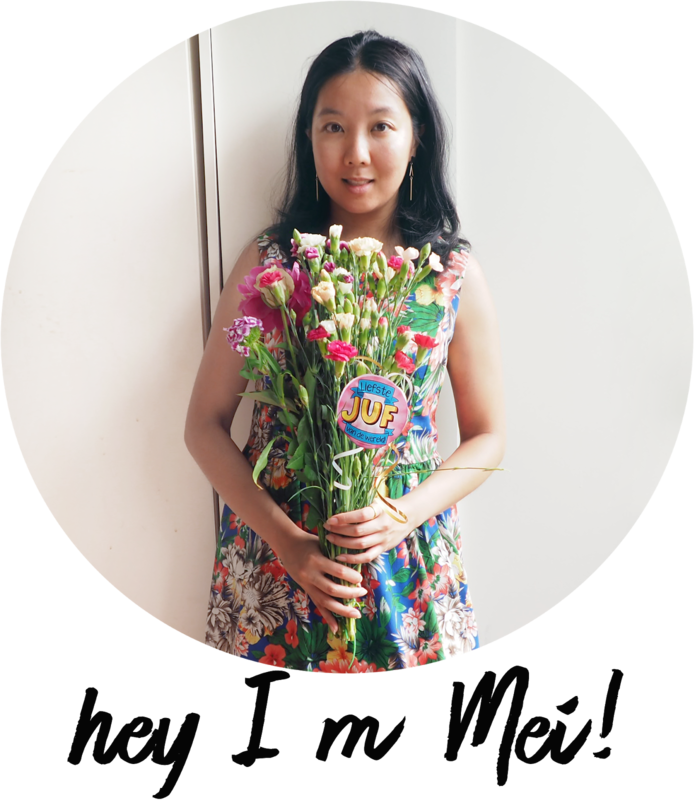 :D <3 i love your blog, been following it for years now ^___^/ always fresh ideas! 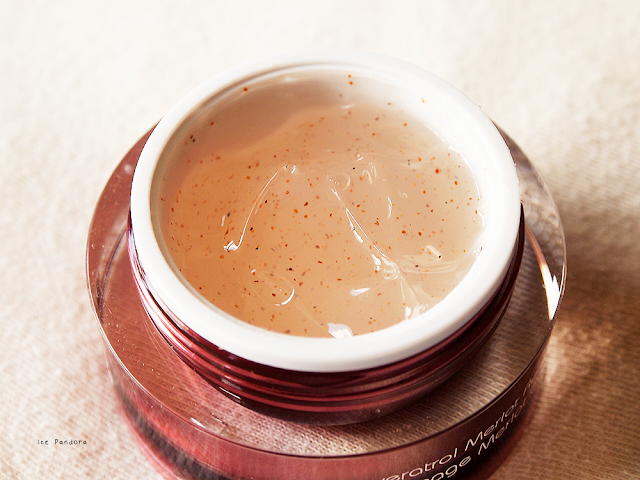 This is looking so lovely ! How fun to make and awesome to share and give to your friends! I love baking bits but I'm not a fan of meringue unfortunately! I find the texture and the sweetness a bit strange but I'm always up for everything else baked!